It’s well known that just about all oscillators drift, or “age”, in frequency with time. In crystal oscillators, the most drift occurs when the oscillator is young, and over time the aging rate decreases. Power-cycling the oscillator results in a new stabilization period before the aging rate stabilizes. The best aging is seen in oscillators that have been running uninterrupted for years. So, I like to say my goal is that my best OCXO won’t get cold before I do! 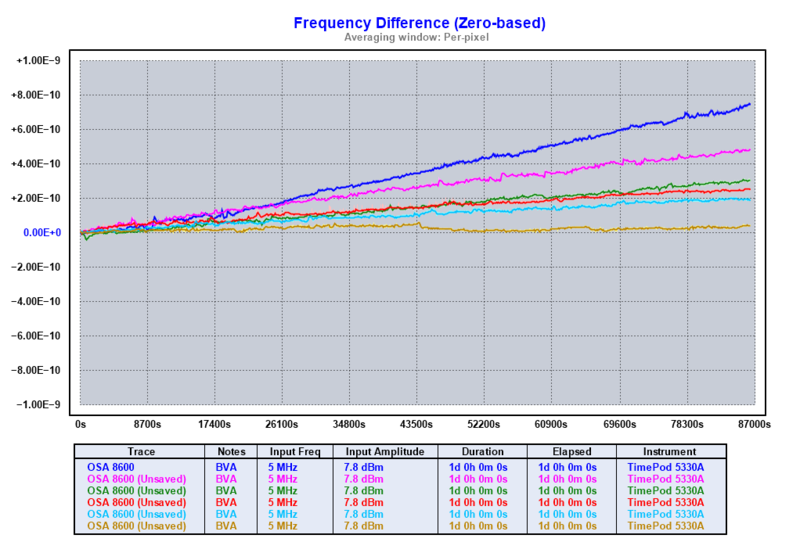 I recently tested a very nice Oscilloquartz 8600B OCXO against my Oscilloquartz 8607 option 008 OCXO. Both are “BVA” oscillators which use a unique crystal mounting method that is said to reduce aging. The 8607-008 is about as good as an OCXO can be, and it’s what I use as a reference for short-term stability measurements. The 8607 has been running continuously for about 7 years, with one minor glitch when a test of the internal batteries showed they didn’t work . The batteries were replaced. In the testing, I did several 24 hour runs over the first week or so after powering up the 8600. These very dramatically show how the aging rate improved day by day. 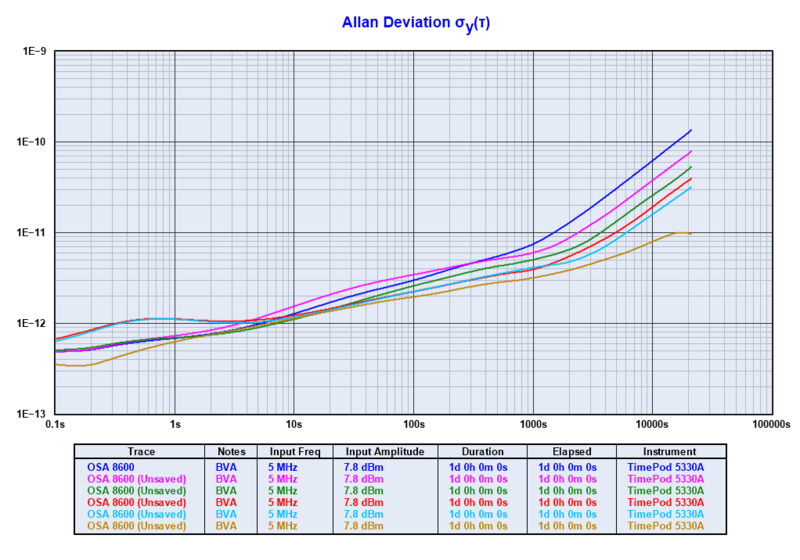 First, here is an Allan Deviation plot showing all the one-day runs. You can see that, with a couple of deviations, the ADEV at longer tau improves with each run. The shorter tau measurements aren’t much affected. More dramatically, here is a graph of the actual frequency drift during each 24 hour period, with the starting frequency shown as zero in the middle of the plot. The starting frequency for each measurement is about the same as the ending frequency of the previous one (there are a few hours of dead time). The last trace shows almost no aging compared to the earlier ones. For full disclosure, there were about three days of dead time between the stop of the previous and start of the last measurement run as I was out of town for a few days. So, it’s easy to see that oscillator drift reduces significantly with running time, particularly during the first days/weeks/months/years.